Something changed that winter, as Derek Landers and Trevor Sullivan stuffed hand warmers in their pockets and felt the negative temperatures seep in through the holes in the garage walls. The two 39-yearold Spokane graphic designers — who refer to themselves as Dumbgun — filled their free time with printing custom T- shirts in Landers’ garage. Both worked full-time but wanted to do their own creative work on their own terms. They froze just so they could feel creative. “We fooled ourselves into thinking we loved what we did,” Sullivan says. But when the reality of printing one or two shirts in the harsh winter dawned on them, they turned their interest elsewhere. To posters. To concert posters. To Pearl Jam. Both are longtime fans of the band (Sullivan saw Eddie Vedder and Co. perform at the Bing here in the mid-1990s), and they decided, after years of making shirts, to reach out and ask to design a poster for them. They didn’t expect a response, let alone an actual offer. Pearl Jam, a band long known for its contributions to charitable causes, was doing a 2007 benefit tour for the Crohn’s and Colitis Foundation of America — a cause dear to guitarist Mike McCready, who has Crohn’s disease. It’s a cause dear to Landers, too — his cousin died at a young age of complications from the disease. A few phone calls and emails later, Dumbgun had an offer to do a custom show poster — as a part of a series — for the Honolulu stop of the band’s tour. Landers and Sullivan got to work — designing a poster that characterized every member of the band as a tiki god. They took a risk: Pearl Jam usually doesn’t allow caricatures of themselves on their merchandise. But the risk paid off. 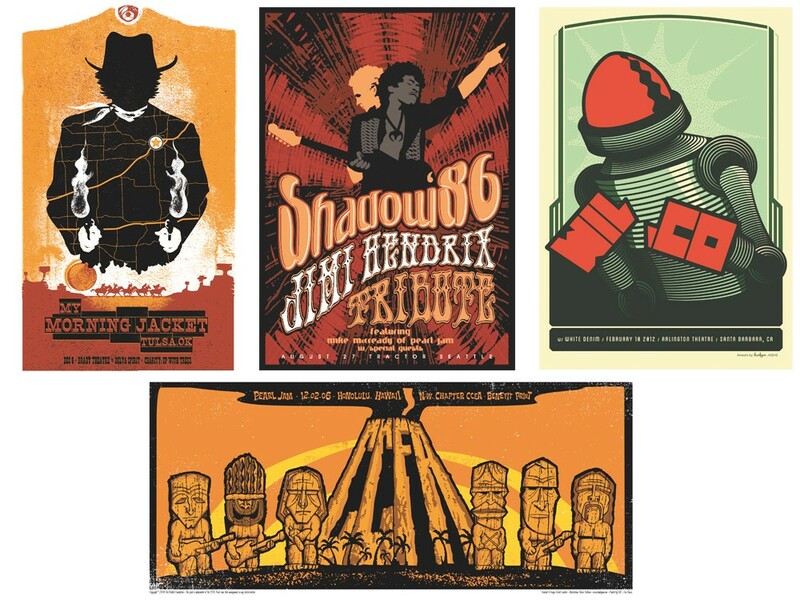 Suddenly, Pearl Jam fans were scrambling on eBay for new versions of the poster — one of which sold for more than $600. And suddenly Dumbgun was being hired to do custom posters for McCready’s other band, Flight to Mars. Landers got on the phone with My Morning Jacket — and did several posters for them. Then Wilco — more posters, all bright, with the same stark, tongue-in-cheek imagery: boxing robots, magicians and birds, alien preachers. They’re funny, but they’re also art. The two say that show-poster design, above any other creative work they’ve done in their careers, is the most gratifying. As they take conference calls with the bass player from My Morning Jacket and the manager for Wilco, they can laugh about that winter in the garage. It’s almost if the cold made them take a leap they wouldn’t have before.